**Pricing in Australian dollars inclusive of international freight, taxes and duties. Searching for a clock that will provide you with correct time down to the second? TimeMachines’ PoE digital clocks will display the precise time once it’s synced up with your network’s time source, be it internet based or local. Using only an Ethernet cable to synchronize and power the clock, you’re able to easily manipulate and control all of your TimeMachines clocks with a single computer on your network and your favorite web browser. It can be vital to make sure your workers operate on the same, accurate time throughout your workspace. Wi-Fi clocks by TimeMachines are the best solution for presenting synchronous, precise time across your building. 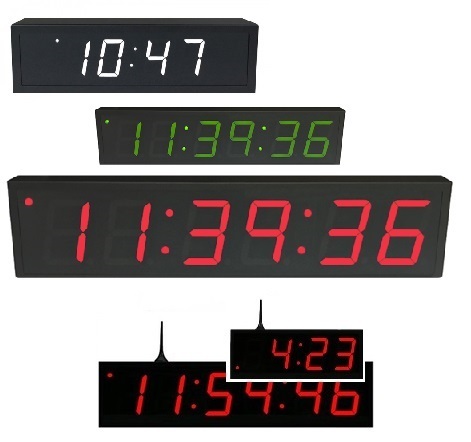 These clocks use Wi-Fi to synchronize their time which means they all display the same time, all the time. Our Wi-Fi clocks are easy to set up: all you have to do is point the clock at your network time server and sync up. You can also run an Ethernet cable to it as well. Powered by an included 12VDC power supply, you’ll never have to worry about employees operating on the wrong time. WIDER digits in the 4″ high digit clocks at 60mm compared to 40 mm wide in other vendors clocks, this enhances distance viewing. Hours, Minutes and Seconds (where a 6 digit clock) are all the SAME size height.